This is my second time brewing a lager. 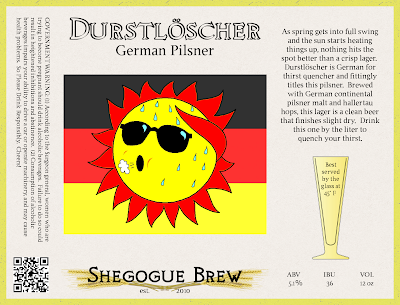 I made a munich helles last year, which came out ok - there was just something off about it. Given the simplicity of the ingredients in these styles, I knew I needed to focus more on my water. I scoured forums and decided that using 50% distilled water for my mash and adding just a little bit of minerals to achieve an estimated 5.4 pH would produce a better beer. Additionally, my parents bought me a stirplate for my birthday, which allowed me to more efficiently propogate the yeast for this batch. This lager pours a nice deep straw color with a frothy white head. The aroma is a strong, crisp and clean smell of malt with some slight yeast character - touch of sulfur. It has medium body with medium carbonation. The beer really showcases the continental pilsner malt, and washing it over your tongue you can pick up a grainy sweetness. The sweetness is really more "maltiness" which is a compliment to the extreme crispness and lack of esters left by the lager yeast. The firm, but pleasant bitterness from the hallertau hops helps the beer finish dry. A real thirst quencher perfect for spring! I left this one in the fermenter a little longer than I would have liked due to my keg issues. It could have a little more fresh hop character, but overall it is pretty tasty. Being my second lager, I am greatly pleased with the outcome. Two big differences between this lager and my first. 1) I used liquid yeast this time, and did a double step starter on my stir plate (used dry the first time) 2) I cut my mash water with 50% distilled water. After writing my tasting notes I decided to go to the BJCP guidelines and see how I was doing. Pretty much falls right in line with the guidelines - I just entered this in two competitions, so hopefully my palate is tasting accurately! this would taste really great with hard shell MD crabs :) Label is a great as the beer!